Saturday, Sept. 12 at 7:30 p.m. — BRANDON — 9 Horses comes to Brandon Music on Saturday, Sept. 12 at 7:30 p.m. as part of its New England tour celebrating the release of the trio’s album “Perfectest Herald” (Sunnyside Records). 9 Horses’ fusion of classical, jazz, and Americana styles is a distillation of their separate influences into one unique voice. 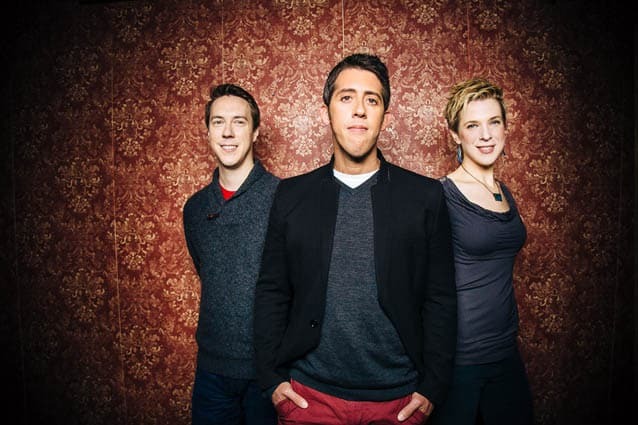 The trio, comprised of Joe Brent (mandolin), Sara Caswell (violin) and Shawn Conley (bass), all leading lights on their own instruments, create a unique and gorgeous blend of instrument virtuosity. All three hail from a classical background, but Brent’s indie-pop sensibility, combined with Caswell’s jazz-inspired lyricism and Conley’s extraordinary skill, taken together are a breathtaking display of color, melody, and rhythmic drive. Concert tickets are $20. A pre-concert dinner is also available for $20. Reservations are recommended for the show and required for dinner. Venue is BYOB. Call 802-247-4295 or e-mail info@brandon-music.net for reservations or for more information. Brandon Music is located at 62 Country Club Road, Brandon.